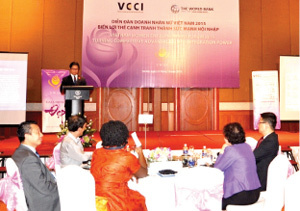 (VEN) - The Vietnam Women Entrepreneurs Forum was held in Hanoi and co-organized by the Vietnam Women Entrepreneurs Council (VWEC) under the Vietnam Chamber of Commerce and Industry (VCCI) in collaboration with the World Bank Vietnam. According to the VCCI’s statistics, women entrepreneurs manage more than 100,000 small and medium-sized enterprises (SMEs) operating in footwear, garments and textiles, agriculture, health and education, contributing about 30 percent of the annual gross domestic product (GDP). Many women entrepreneurs have proved successful and have taken the lead in Vietnam as well as the region. In the context of increased international integration, many free trade agreements (FTAs) have been signed, opening up new opportunities for footwear, garment and textile, seafood and agricultural products. For example, Vietnam’s garment and textile exports to the EU will reduce from 8-16 percent at present to zero percent in the next 7-8 years, said Le Trieu Dung Deputy Director of the Multilateral Trade Policy Department under the Ministry of Industry and Trade.According to Victoria Kwakwa, the World Bank’s Country Director for Vietnam, Vietnam has significantly improved its legal system since its participation in the World Trade Organization (WTO), FTAs and TPP, with positive market-orientated amendments and supplements to laws and regulations. VCCI Chairman Vu Tien Loc suggested that to make the most of opportunities from FTAs, enterprises should learn about the impacts the FTAs are likely to have, and draft action plans and take appropriate measures. 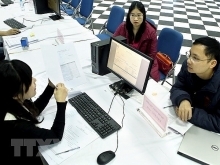 “Domestic women-managed SMEs should link with each other to pool their strengths,” he said. According to TH Group President Thai Huong, domestic enterprises should consolidate a foothold in the market through improving product quality. “In the context of increased international integration, foreign companies will come to Vietnam and head-hunt; so, Vietnamese companies should take good care of branding and have incentives for the talented, while domestic consumers should prioritize using Vietnamese goods. Concretely, domestic companies should immediately focus on the production of zero percent-taxed goods items or on items with competitive advantages to secure a firm foothold in the market,” said General Director of the Garment 10 Corporation Nguyen Thi Thanh Huyen.